Round Eye Supply offers a great lineup of wholesale brownie mix products from name-brand manufacturers, including Continental Mills, General Mills Brownie Mix, Krusteaz, Ghirardelli Brownie Mix, Duncan Hines and Pillsbury. 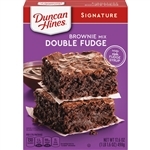 Duncan Hines offers both a fudge brownie mix as well as a double fudge brownie mix packed in 17.6 ounce boxes, 12 boxes per case. Other box brownie mix options offer similar wholesale-sized savings, such as 6-pound boxes sold six boxes per case. 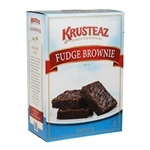 Continental Mills Krusteaz Fudge Brownie Cake Mix - 7 Lb. General Mills Sweet Rewards Low Fat Brownie Mix - 6 Lb. Pinnacle Duncan Hines Chewy Fudge Mega Brownie Mix - 84 Oz. 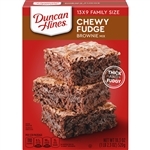 Pinnacle Duncan Hines Chewy Fudge Family Size Brownie Mix - 18.3 Oz. Pinnacle Duncan Hines Double Fudge Brownie Mix - 17.6 Oz. Bakers Plus Brownie Mix - 50 Lb. Glutino Double Chocolate Brownie Mix - 16 Oz. Bulk brownie mix also comes in 50-pound bags, as in Pillsbury Bakers Plus or Continental Mills' Deluxe Triple Chocolate mix. Dry brownie mix and cake mix brownies baked with Krusteaz Fudge Brownie Cake Mix made with wheat flour and Dutch cocoa are moist and fudgy, shipped in cases of six 7-pound boxes. Krusteaz also has a gluten-free brownie mix, so individuals who must restrict gluten intake can still enjoy the pleasures of a sweet, tasty treat. Also, try the General Mills Sweet Rewards Low Fat Chocolate Brownie Mix. We have been selling bakery Brownie Mix for 40 years. We know how to take care of your restaurant supply baking needs.